A firefighter battling the flames in Aviemore. Forest rangers have urged walkers and campers to be more vigilant due to unseasonal wildfire warnings. Last year much of Aberdeenshire was blanketed in ice and snow by the Beast From The East, but 12 months on much of the north and north-east is enjoying drier and warmer conditions. The improved weather, however, has brought with it an increased risk of wildfires breaking out. Yesterday, the ranger service at Deeside’s Glen Tanar Estate confirmed it was on high alert due to dried bracken, heather and grass. The warning on social media was subsequently shared by Aberdeenshire Council’s ranger service, which confirmed there was a similar risk across “many parts” of the region. Fiona Banks, ranger coordinator, said: “Managing fire risk is something we focus on all year round and particularly when the weather has been dry and warm. 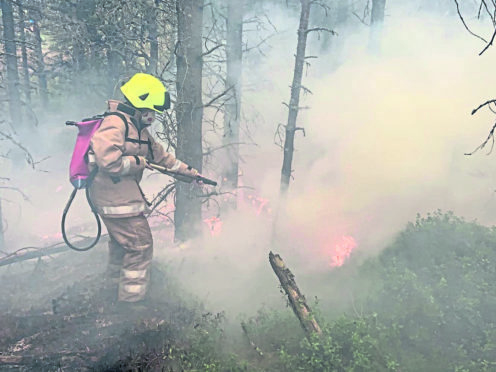 “We wouldn’t normally expect to see fire warnings being issued as early as February but the current fine weather does increase the risk of the spread of fire and we would urge everybody to take extra caution. The warning comes just days after a wildfire raged in the Highlands for more than 24 hours. It was brought under control by firefighters from more than eight fire engines, three water units and community support vehicles from a 100-mile radius. The blaze at Rothiemurchus, near Aviemore, spread to 1640ft by 328ft – the length of 10 football pitches. It was started by a faulty power cable and ignited by gusts of winds in the Cairngorms of 30-40mph.